One says of Galileo, that he was not able to convince his contemporaries that the Earth was round and turned. As it is known, Foucault was in the middle of century XIX, more than two centuries after Galileo, that demonstrated publicly that the Earth rotated. He suspended a pendulum under the dome of the Pantheon of Paris, using a cable of 67 meters (73 yardas) the length and one sphere the 28 kg (65 libras). The plane of oscillation of the pendulum should remain invariable in the space if doesn't intervene external forces, but as the Earth it rotates on their own axis, all the present understood that the lateral movement was caused for the rotation of the Earth, since the inertial moment is conserved. The chance or the bad fortune, according to as it is watched, I had to work in the railroad station in Chamartín (Madrid-Spain) in a company of packages. In my work I took for on the platform of the railway, a trolley car to motor that was able to throw of about 10 cars or more (baggage trolleys). Very similar to the baggage trolleys that transport the suitcases in the airports. When they assigned me a trolley car to motor already said me that it had to circulate for on the platform of the railway by the left, to avoid that the baggage trolleys fall to the rail road. Personally, I proved the truthfulness of this fact experimentally in more than an occasion having my companions reason, with the consequent reprimand of my heads, machinists, inspectors of circulation and others. Really, if I circulated for the right, the baggage trolleys is fell to the road of the railroad. I still remember that asked to my companions why this happened. All they told me the most intuitive. The platforms of the railway are inclined towards the right! They are not well built! And sure, I thought, how a rail station with more than 12 platforms of the railway and with a longitude of about 400 meters (425 yardas) or more each one, all they will be not well built and toward the same side? In days of rain, I made sure that the platforms of the railway spilled water correctly, half of the platform towards a side and other half, towards the other. That is to say, they correctly were constructed. Then, why we was necessary to circulate for the left on the platforms of the railway? Reading me scientific books in those years, towards 1.993, I found with the Coriolis force. 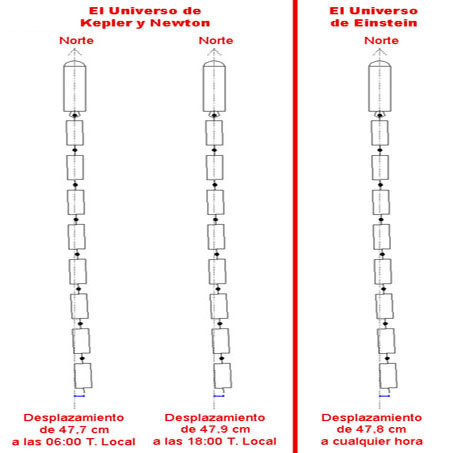 They have always given the example that when removing the plug of a washbasin full with water, it rotates in the entrance to the drain in sense contrary of the needles of the clock in the North hemisphere, and in the South hemisphere on the contrary. This myth is absurd, since the aleatory movement of the water and the unequal friction of the washbasin is very superior to the Coriolis force. It is as making rotate the ocean with the movement of the hand. The effects of the rotation of the Earth are of great importance in the study of the wind systems, the marine currents and the launchings of rockets. As sailor, Colón knew it perfectly, although he didn't know the why. He knew that to arrive at the "Américas" in the easiest way, he was necessary to go first a Canary, so that the maritime current pushed him toward there and to return, towards Spain, pushing him the same maritime current. Although it seems the same physical law, the force Coriolis and the revolvable movement of the pendulum, they have their big differences. Of agreement that is produced for the revolvable movement of the Earth on their axis, but while the force Coriolis is accumulative, the revolvable movement of the pendulum is always constant. For example, the right part of the rails of the trains in the North hemisphere they are more worn away, caused by the boxcars that it takes the machine when making effect "whip". Only in theory, because in the practice it is completely unobservable for the great resistance to the waste of the rails (I have verified it personally after being more than 13 years in you hire rail). Also, I am assuming that the trains have two rails, one for each sense. That is to say, I am supposing that the trains always circulate in the same sense on the same rails. That at the beginning is a small force in the first boxcars, it is converted a great lateral displacement at the end of the boxcars or in the previous example, in the Baggage Trolleys for what the Coriolis force is accumulative. The revolvable movement of the pendulum only depends on the observer's latitude and not of the long or big that is the pendulum. In fact, the Coriolis force is so intense that it determines the total number of Baggage Trolleys that we could transport, because although we circulated for the left to avoid that they fell to the road of the railroad, the last Baggage Trolley didn't only touch the pillars of the stairway, if not that they were able to be incrusted, being able to stop the trolley car to motor totally. Another example would be that the right part of edge of a river it is much erode, so much laterally as in depth that the left side in general. On the contrary, the lateral turn of the pendulum is constant the same as the day movement of the Earth, because the inertial moment is conserved (well the engineers of the artificial satellites know it when they install the gyroscopes for not losing the reference coordinates in the space). 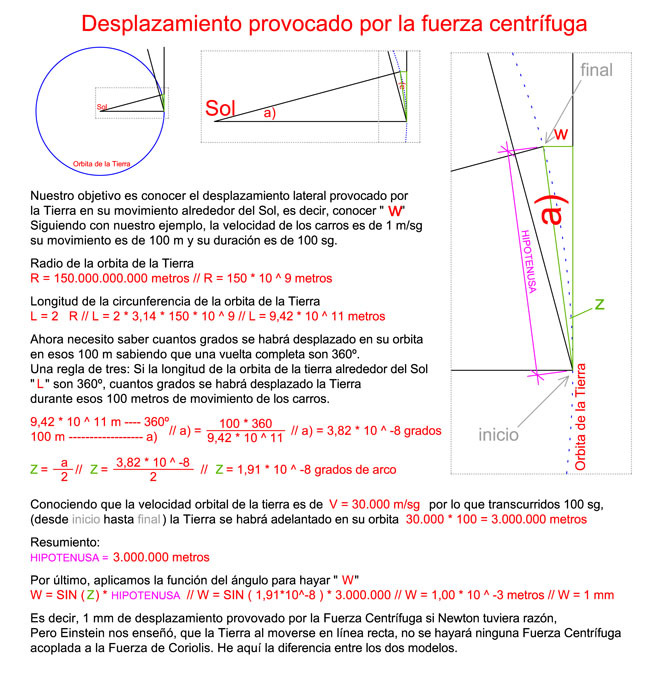 Here I have to clarify that the form and intensity of the Coriolis Force depends of if the object in movement is in free fall or parallel to the floor. If it is in free fall, the object in movement will move toward the East being null in the poles and maxim in the equator being perpendicular to the terrestrial axis. On the contrary, if the movement is parallel to the floor, that is to say, perpendicular to the previous movement or free fall, then the objects in movement will move toward the right in the North hemisphere and in the South hemisphere toward the left, being null in the poles and in the equator, although increasing of intensity toward the equator since we are more and more far from the terrestrial axis. What happens is that it becomes null in the equator to be it the object in movement in a parallel plane to the terrestrial axis. That is to say, the Coriolis force causes a lateral displacement caused by the revolving Earth movement on its axis. Then following this same reasoning, the Earth has another weaker revolvable movement: The movement of Virement around the Sun. Other weaker movements exist in our planet, as the Libration of the Moon, that it causes a to shake to our planet or that of Precesión of the Equinoxes. But our attention will be centered in the movement of Virement. As Sir Issac Newton taught us, considered like the greater scientist of all the times, the Earth turns around the Sun thanks to the gravitational force, causing a revolving movement. Then, if we make the same experiment with the baggage trolleys to detect the Coriolis Force to the dawn and afterwards 12 hours later, in one this small effect would be added and in the other experiment it would be subtracted. This value experimental it would be twice as much that this small effect, as it is also the parallax anua of a star. Of here it is verified that this effect is independent of the latitude, being weaker 365 times with regard to the place where us to have carried out the experiment, although the experiment develops it in any place of the planet. That is to say, to be able to get an experimental measure of 2 millimeters that would be exactly inside our mensuration possibilities, (a millimeter toward the left and 12 hours later, another millimeter toward the right), we would need that the Coriolis Force causes a lateral deviation from our baggage trolleys of 366 millimeters to the 06:00 Local Time and 364 millimeters at the 18:00 Local Time, provided our place of the experiment is located near latitudes at the Ecuador, where the Coriolis Force is maximum in this case. This would be truth if Newton were right, but Einstein taught us that the Earth moves in line straight on a cuatridimensional universe. That it seems us that the Earth rotates around the Sun in curve, it is because we are beings of three dimensions and we observed the universe in those same dimensions. What do I mean with this? That the weak effect that I wanted to find in the previous experiment for the movement of virement of the Earth would be nonexistent, because like I have said before, the Earth moves line straight line around the Sun, and this concept is expandable to all the smaller other movements that the Earth has, because it will always move for the universe for its own inertia on line straight line, in an cuatridimensional universe. I will obtain the same negative result that the experiment of Michelson and Morley to know the speed the Earth through "aether", and is when Einstein appeared to explain us that the speed of the light is independent of the speed of the observer. Now it is when in a very subtle way and delicate, we will be able to discover the truthfulness of the theory of the general relativity. Always they have been given the three typical examples in favor of this theory, that they are: The advance of the perihelion of the Mercury orbit, the deviation of the light of stars near a gravitational field and the delay of the clocks. Lately, we have other tests to their favor, for example double quasar, the gravitational lenses, the reddening of the white dwarves or neutron stars, the energy loss in a very narrow compact system causing a slow estrangement among both with the rising decrease of the orbital speed, etc. It is clear that these observations and experiments are not within reach of anyone. The biggest telescopes in the world are needed to check the truthfulness of the theory. The experiment that I have just edited if that one could discover with the daily means that we dispose. The force Coriolis is so intense to the being an accumulative force, that although we carry out the experiment with some baggage trolleys of very little quality with the crazy wheels it is appreciated perfectly since it has a very considerable lateral displacement (almost as much as the baggage trolleys of the supermarkets). In fact, it was a pain not to be able to quantify the lateral displacement in those years because I needed to carry out some how many mensurations for then to make the stocking and other so many ones, 12 hours later with the same baggage trolleys. I think that my boss would not understand it and also before all the passengers. The problem of these experiments, is that as Einstein is right, in our measures they will be equal within the precision errors that we can make. We should not attribute them to the little precision, if not that the Earth moves on line straight around the Sun, through the space-time, in a cuatridimensional universe. A beautiful and easy form of verifying the truthfulness of the theory of general relativity without having to appeal to the great observatories or to the experiments developed with the greater degree of precision. 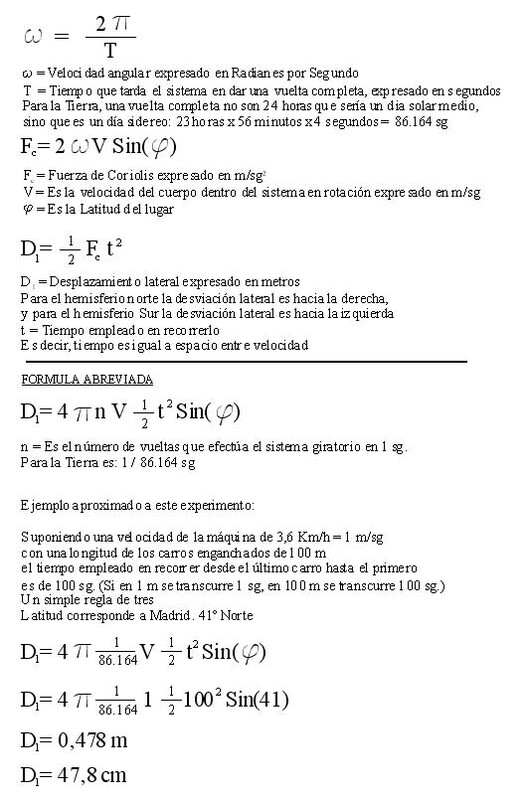 I understand that you will ask yourselves, how it is possible to verify the theory of general relativity with a so simple and rudimentary experiment in the measurements? Then there are two options: That to anybody it has thought it or something something fails in my thesis. At the moment, I do not observe any error. Sincerely, I would thank your critics. 1º) Here I am demonstrating two experiments that it corroborates the rotation of the Earth: The Foucault pendulum and the lateral displacement caused by the Coriolis force. If Galileo had made sure of some of these two experiments, discovered centuries later, they had not condemned him to blaspheme. It would be very complicated for their contemporaries, to have put another argument type that was not the rotation of the Earth. 2º) In the universe of Kepler and Newton, the planets rotate around the Sun in curve, they even accelerate when they go by the perihelion. In the universe of Einstein, the planets have a movement inertial uniform and they move on straight line around the Sun. That it seems us that they rotate around the Sun and accelerate it is reason that we are beings of three dimensions, but the reality is that the planets have a movement inertial uniform and on straight line. The great difference among these two models, is that in the universe of Kepler and Newton, the Earth would have a centrifugal force constantly coupled to the Coriolis force because it would move in circles around the Sun, but in the universe of Einstein, the centrifugal force coupled it would not exist to the Coriolis force since the Earth is moved on straight line. 3º) As the Earth is moved on straight line in the universe of Einstein, the Coriolis force causes a lateral displacement, alone and exclusively caused for the rotation of the Earth on their axis. Of all the smaller movements that the Earth can have and swingings that it causes the other planets to its step, the Earth will always move on straight line through the curved space-time. The Earth doesn't balance and it changes direction. It is the fabric space-time that is deformed so that the Earth always goes on straight line. 4º) I am also exposing an experiment that has never been carried out beyond the demonstration of the rotation of the Earth on their axis. It is necessary a bigger precision to reach the theoretical pattern here described and we cannot discard the practical demonstration, simply because we know in what universe type we live. In the universe of Kepler and Newton, or in the universe of Einstein. That is to say, if we live in an universe of three or of four dimensions, and if really the gravitational force curve the space-time. 5º) Even when an object or a single particle approaches a black hole near the speed of light and borders, near the event horizon, the universe of Kepler and Newton, we would think that the object would suffer a brutal centrifugal force near the perihelion, it would even be broken. But in Einstein's universe, as the object has an uniform inertial movement and mainly in lines straight, rejecting the other forces, even when their speed is near to the speed of the light, this object would not feel some difference. We would think that the object is in a calm part of the universe. (If the object is broken, it is not for the centrifugal force, it would be for the tidal force). That is to say, if I carried out an experiment on board to capture the centrifugal force, I would not find it. In fact, a mistaken argument is that the synchrotron radiation is caused by the high speed of the particles near the quasar. The true cause is that the quasar emits synchrotron radiation because the intense magnetic field deviates the trajectory of the electrons of their natural movement on straight line, to the deviated being. The thermal radiation is produced by the friction of the particles. 6º) Continuing with the same argument that the previous section, if we take a laser and a gyroscope on board and we made them point forward, that is to say, in the address of our movement toward the black hole, when we passed near the perihelion as much the laser as the gyroscope they would vary in the same quantity of movement that us that we take them on board, always pointing forward, but the bottom stars, we would not have in front of us, if not that they would be rotating toward a side. That is to say, the whole universe would be that rotates toward a side. In this point it is broke any reference system relative. 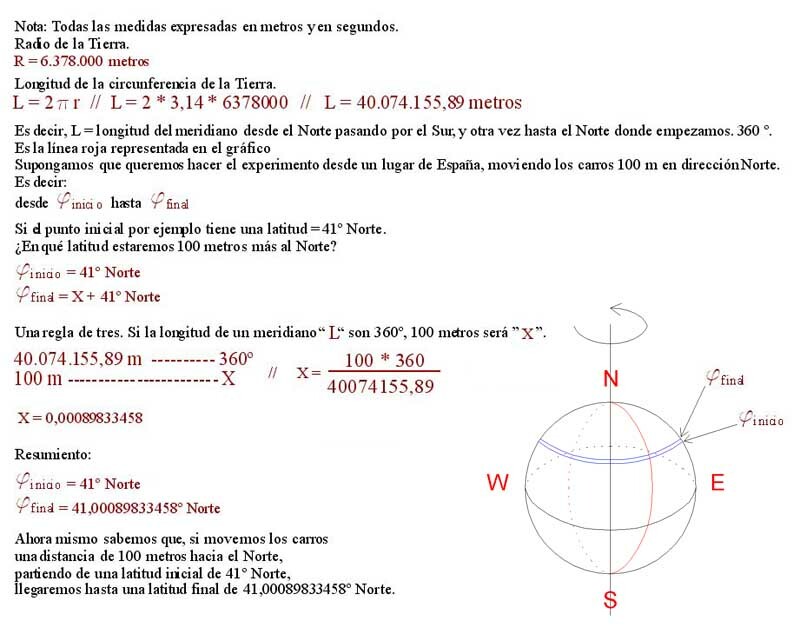 7º) The mathematical formula of the Coriolis force is different that here I expose, since I don't want to know which is the quantity of generated force, but how much it is the lateral displacement that causes the Coriolis force. 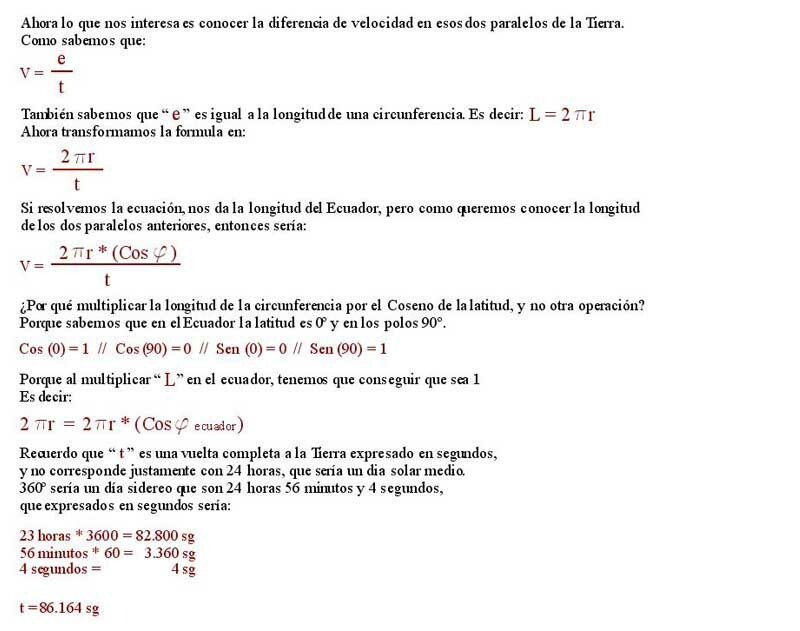 For that reason, in the classic formula of the Coriolis force comes implicit the mass. To know the lateral deviation it doesn't influence at all. 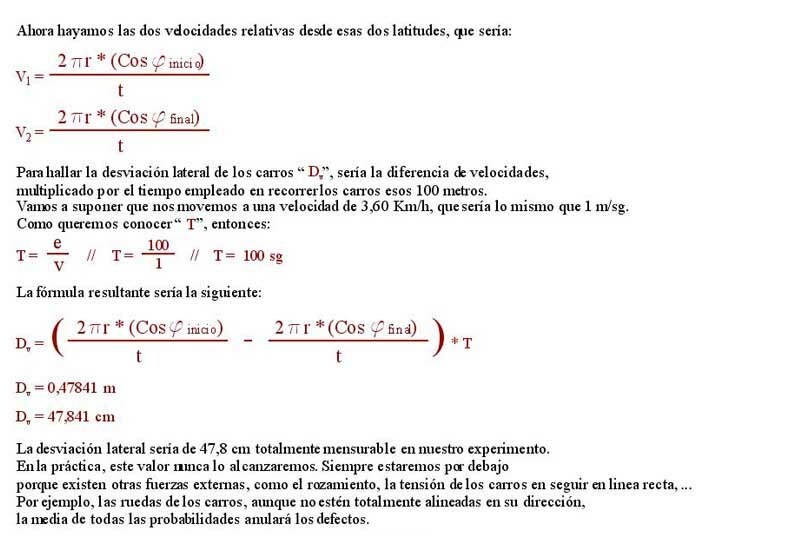 That is to say, the quantity of lateral displacement caused by the Coriolis force, it doesn't depend on the mass. This study is to basically say that a relatively simple experiment, you can tell if we live in a universe of three or four dimensions. The fundamental difference is whether the Earth moves around the Sun in curve (caused by gravity) in a world of three dimensions or moves in a straight line (in the space-time fabric) in a four-dimensional universe. What is clear is that the centrifugal force would be found only engaged in moving bodies if the Earth revolves around the Sun in curve (Newton Universe), and not in a straight line (Einstein 's Universe). That is, the rotation of the Earth causes the Coriolis force and the motion of the earth around the sun causes the centrifugal force alone in a world of three dimensions. Here lies the difference to know if we live in a universe of three or four dimensions. If bodies experience or not centrifugal force. Note: from a simple observation of nature, what I do is take it to its fullest, and even take it to the absurd, to see the truth of my theory.